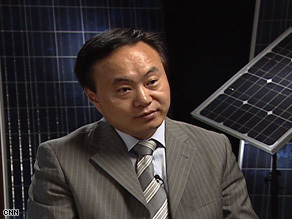 (CNN) -- The increasing global focus on renewable energy could not have come at a better time for Dr. Shi Zhengrong, an Australian citizen and Chinese-trained scientist who says he got into solar power by chance. Shi estimates that the solar energy industry could be worth $50 billion by 2010. Shi, 44, is the chief executive of Suntech Power Holdings, one of the new breed of successful domestic China-based companies with global ambitions. After spending a year at Sydney-based University of New South Wales' renewable energy center in 1988, Shi found himself at a company formed to commercialize the ideas of fellow researchers. "I never thought this solar business could take off or become commercially viable. I thought I just needed to concentrate on my research and publish papers to do my job as a scientist," Shi told The Associated Press in an interview. Regular trips back to his homeland China to lecture on solar power coincided with a global push for renewable energy. He says he saw an opportunity to make a difference in the world's energy industries. "Solar power and other alternative energy is definitely the answer to sustainable development of human life, especially to resolve this global warming issue," Shi says. The government of Wuxi, a city on Shanghai's western outskirts with ambitions as a high-tech center, put up US$6 million in 2001 to finance Suntech. Shi bought out his backers and listed his $225 million (sales) company on the NYSE in 2005 where the company's market cap soared to $5.5 billion. Depending on the company's current share price, his worth hovers around US$2 billion. Suntech, which started with 20 workers, remains headquartered in Wuxi, but now occupies four sites with a total workforce of 3,500. The company's photovoltaic systems are used in a wide range of applications, including communications and broadcasting, transportation, housing and military. Currently under construction in Wuxi is a giant energy wall, a curtain of solar cells integrated into the city's airport. It's a large-scale advertisement for the technology of Suntech, but currently the biggest market for it's products is Europe. A major exporter to the rest of the world, Suntech's aim is to reduce the cost of production to a point where China actually uses a far greater share of current sales. Only about 10 percent of Suntech's 2006 sales of US$599 million were in China, with 80 percent of Suntech's products going to Europe, in particular Germany. "We use the energy in China to manufacture these things, so we take the blame for using the energy in China then we ship them out of the country," says energy analyst James Brook. "When the cost comes down a little bit more, the market will be booming in China," Shi says. CNN's John Vause and journalist Bina Brown contributed to this report.